Zamalek recorded their biggest victory yet under Ihab Galal and extended their winning run to six matches after crushing Talae El-Geish 3-0 at Cairo Stadium on Tuesday. First-half goals from midfielder Mahmoud Abdel-Aziz, defender Mahmoud Alaa and striker Kabongo Kasongo gave Zamalek all three points, in a game that saw in-form keeper Ahmed El-Shennawi block a Geish penalty. Zamalek remain in second spot of the league table with 51 points, four ahead of third-placed Ismaily who played two games less. They are vying with Ismaily and Masry for the second place which earns qualification for the African Champions League. Just four minutes into the game, midfielder Abdel-Aziz gave Zamalek the lead with a delightful free-kick from outside the area that beat keeper Mohamed Bassam at his near post. Five minutes later, ex-Smouha midfielder Abdel-Aziz could have doubled his side's lead with another free-kick, only to see his effort go narrowly wide of the post. Geish, on the other side, were happy to sit back inside their own half and press Zamalek's midfielders in an attempt to disrupt their play, a tactic which they didn't change despite conceding more than once. Zamalek's second goal came four minutes from half-time, when Maarouf Yussuf played a free-kick quickly into the path of Tunisian defender Hamdi Nagguez, whose square pass inside the area eventually found center-back Alaa. 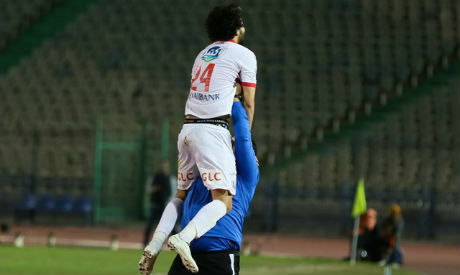 Alaa's initial effort was initially blocked by a Geish opponent, before the former Degla center-back smashed home on the rebound, doubling Zamalek's advantage. But the best of goals came on the stroke of half-time from Congolese hitman Kasongo, who managed to latch onto a through ball from Mohamed Antar during a Zamalek counter to break clear and slide home past the keeper. Shortly after midfielder Abdel-Aziz saw an effort narrowly miss the target on 56 minutes, the visitors came close to pulling one back from the penalty spot, after Nagguez, deployed as third center-back, was adjudged by the ref to have fouled Senegalese forward Talla N'Diaye inside the area. Keeper El-Shennawi, however, was there to deny Islam Gamal's badly-executed penalty one minute from the hour mark to preserve his side's three-goal lead. El-Shennawi then came to pull off a magnificent save when he thwarted a through-on-goal N'Diaye, who beat Zamalek's improperly executed offside trap to break clear in the 72nd minute. Kasongo could have bagged his personal double of the night, but was unfortunate to see his effort blocked by the Geish keeper, as Zamalek claimed another vital win in their bid to finish second of the table.